← Diary of a Mad Gardener. Well, this trek wasn’t all it was quacked up to be. Today, I really didn’t know how to act … it’s been ever so long since my feet found their way to Council Point Park to travel my favorite Park path. It’s been weeks, not even days. So you’d better feel my forehead to make sure I am okay. But, the last few weeks have just not been conducive for walking … there were errands, then a five-day stint out making the front and the backyard look presentable. Then more errands, followed by two days of constant rain. Then grocery shopping. And, don’t get me started on the war I’ve been waging with the robins who keep building nests and I keep tearing them down. The errands, albeit walking errands, garnered a few miles toward my end goal of 500, but they were nothing special to write about. I’ve even managed to miss my Easter, Memorial Day and end-of-May mini walking goals that I’d set for myself many months ago. Well, I put it all behind me and decided I just had to venture out and take that newfangled camera with me. This morning I aimed to make it “all about me” and return to the Park where I suspected that the goslings were already sporting an awkward teenage look and the ducklings were probably swimming in a neat row after their mama and diving for tadpoles. Somehow, I missed the whole baby scenario. The last few years I’ve meandered along the Park path and been lucky enough to see the Canada geese parents with their offspring toddling around behind them as they grazed. And last year I oohed and aahed along with the other Park walkers as I came upon the ducklings close on their mama’s tail and I snapped pictures of all of them. So, today I left the house, clad in a warm coat as it was only 47 degrees out. I packed the coat’s cargo pockets full of peanut packs on one side, and the other had torn-up bread in a plastic produce bag spilling out of the other. And, of course, I took that new camera, eager to christen it at the Park, but not before I had to quickly re-read the operating directions and finally thread the wrist strap into its proper place. So, off I went, hoping the experience would be everything I’d pictured in my mind … that would be Mother Goose and her brood posing prettily while I zoomed in and out until I was happy with the photo. And, in my mind’s eye, the squirrels would follow me, as they have in the past, just like I was the Pied Piper and I’d be doling out treats with one hand and happily snapping their pictures with the other hand. 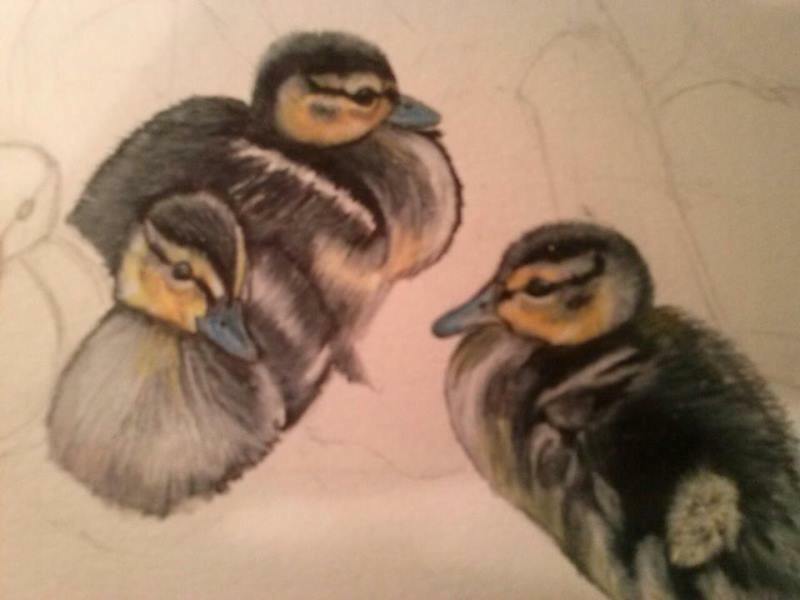 I’ve been inspired the last few days by my childhood friend, Maggie Rust, who has been creating duck drawings and posting that artwork on Facebook, where her friends have delighted in watching the nightly progression of her duck work. So Maggie’s ducks inspired me to go to seek out the real deal and get some pictures for this blog. Well … that’s how I envisioned my morning anyway. Unfortunately, it fell short of my expectations after I arrived at the Park and no mischievous squirrels came running over to greet me. As I walked along, I realized the geese had gone AWOL as well. And, it appeared that I was up a creek, because the ducks and their wee ones sure were not swimming in this one. Even that lazy old heron that fell asleep in the old dead tree for a few hours last year while I was shooting its picture was not present and accounted for. Did all the critters leave and go to another park perhaps? Musing on that thought, I did another lap with nary a songbird trilling and thrilling me in the crisp morning air. No really – where did everyone go? It seems they all ducked out on me. Slowly I slid the camera back into its pouch, somewhat disillusioned over my long-awaited return to the sanctuary and started to walk home slowly. Just like Maggie’s duck drawing, my visit seemed as yet unfinished … a work in progress. And, like Maggie’s duck drawing, the best is yet to come. 4 Responses to Well, this trek wasn’t all it was quacked up to be. I didn’t get it either Ann Marie – today was beautiful. Sometimes the squirrels follow behind me in a row … some of the people at the Park giggle when they see it. I did write a blog last year about them following me – several at a time, but I didn’t have a picture of it. Sometimes, on a sunny day, I see their shadow. I think they were tucked in their nests (squirrels and the birds) and didn’t want to come out in the cool air. Hey where did all critters go? I can’t believe they all disappeared just when you were going for a good shot. The duckling picture is great. I agree. And today, I didn’t take the camera and I saw that ugly round brown thing – maybe a gopher??? on the church grounds near Memorial Park. Saw him there last year – don’t know what it is – guessing a gopher. He is fat but can run pretty fast. Then he stops and stands on his haunches and looks at me. Of course, did not have the camera, but he isn’t too cute to look at.